tangy bite from this cool mousse decadence. refreshing dessert will be none other than my Mommy. This is, her favourite no-bake lemon pie. She considers this one to be absolutely divine. Why I cherish this unique citrus fruit so much? At first, the vivid colors alone impart an invaluable burst of aesthetic pleasure. 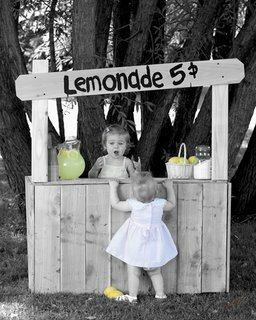 when selling their fresh lemonades at the curb. Yes, I was that child as well. Were you? a small piece of pride and satisfaction. hence, the yellow color on ‘smileys’ ? of flavours and aromas that will go a long way to enhancing any recipe. I also appreciate the fact that the lemon’s tartness acts as a great salt substitute. This asset alone has reduced my salt intake...leading towards healthier habits. The lemon makes my kitchen come alive. as it sprays its fragrance throughout my home. desirable odours linger from say...fish meals. back to lemons and dessert. my top ten ingredients to have on hand. I do believe it is the most versatile of all citrus. 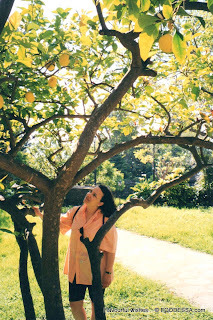 are the ones most blessed with an abundance of wonderful lemons year round. They are also responsible for the largest quantity of lemon fruit export. also contribute grandly to the production of this widely consumed citrus. 'Eureka' variety which has a few seeds and very juicy while slightly more acidic. smaller, smoother skinned and has practically no seeds. Then, there’s the pricier and most apparently desired sweeter 'Meyer' lemon which is the least commonly commercially produced due to its lower shipping survival. Therefore, not always easily found in stores. This situation is slowly changing due to higher consumer demand. The 'Meyer' lemon is a hybrid cross between a mandarin orange and a sour lemon along with owning a very pleasant floral aroma. The small downside to the Meyer lemon however, is that it's not popular for its abundance of lemon oil usually captured by the lemon zest. while in Bastia, Corsica, France. 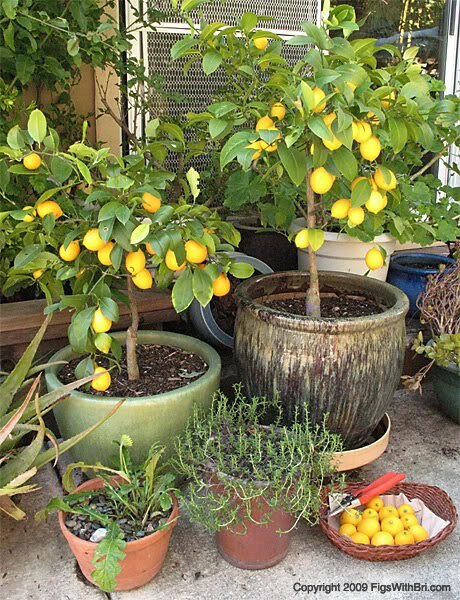 Did you know that the Meyer lemon tree is commonly grown as a dwarf variety and perfectly suitable to grow in container pots? 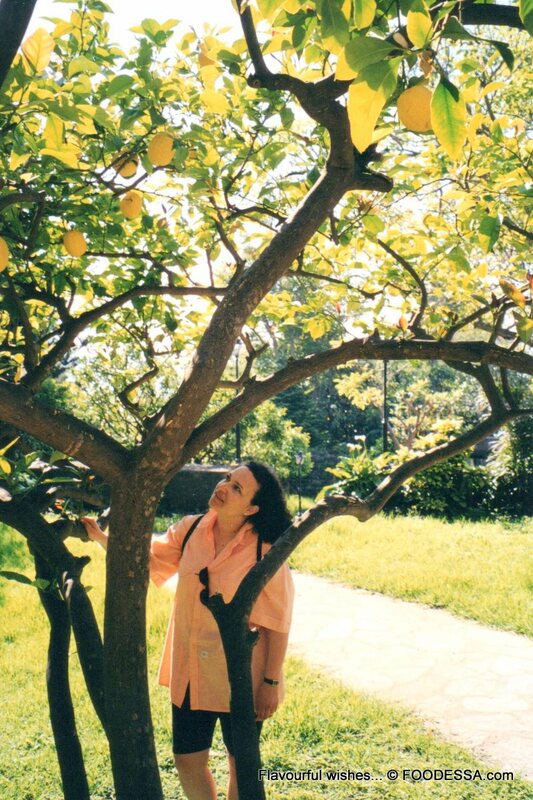 Like most, I do not necessarily have access 'Meyer' lemons, therefore, I make sure to buy the freshest, heaviest and most aromatic lemons possible. Also, keep in mind the incredible versatility of this recipe. It can be quickly adaptable towards other citrus. the sweetness slightly to your desired taste. you just may have to increase the sweetness content by 25%.
. Always choose lemons that are completely yellow. 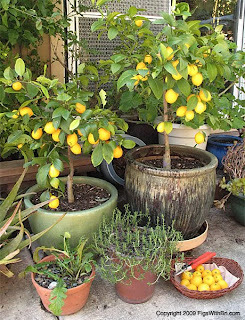 Those not fully ripened with green tinges will be more acidic and should be avoided.
. You can keep very fresh lemons in a cool, dark place for about a week before having to refrigerate them. Afterwards, place them into a plastic bag and loosely package them in order for them not to dry out when they're placed in the refrigerator.
. When figuring out how many lemons to use...calculate about 1 medium size lemon which will yield about 4 Tbsps. (60ml) of lemon juice.
. To extract more juice out of the lemon, make sure that it has reached room temperature and then plop it into a bowl of warm water for a few minutes. Prepare a lightly oiled pie plate and set aside. 1. In a blender, add the cookie crumbs along with the melted butter, vanilla and the sugar. Pulse the motor a few times to then spin until a good humid crumble appears. Pour it out onto the lightly oiled pie plate. With the aid of a spatula or spoon, spread and pat down the mix onto the plate’s bottom and sides. Set aside. 2. In a chilled, medium sized stainless steel bowl, whip the cream with an electric mixer. When a ribbon trail starts showing, it's almost ready. Careful not to over beat. Set this whipped cream temporarily aside in the refrigerator. 3. Clean the whisks and dry carefully. 4. Meanwhile, separate the eggs and set aside the yolks in a tiny bowl. 5. In another medium size bowl, whip the egg whites until frothy. Gradually add the sugar and beat until soft peaks have formed. Afterwards, the egg yolks can be added one at the time. Beat well between each yolk.
. Take out the chilled whipped cream and with a spatula fold it into the yellow sweet mix until there are minimal streaks showing. Now, add the lemon juice and blend well.
. Pour the combined mix into the prepared crust.
. Garnish the perimeter of the pie's surface with the reserved crushed cookie.
. Decorate according to your creativity or as shown in photo.
. It is best to cover and freeze the pie for a minimum 3 hour period. I'm in lemon heaven with this cool mousse pie.